After getting his bachelor’s degree, Ibrahima found himself at a cross roads and had to decide whether to follow a ‘hard rock’ career in mining, or move into the relatively new field, for Côte d’Ivoire at least, of petroleum geology. “When I started as an undergraduate the only hydrocarbon exploration in my country had been in colonial times. Little had been found, but the country had a very appealing iron ore mining potential thanks to the vast banded ironstones in the WestAfrican craton part of the country,” he explains. “However, in 1974 we finally had a significant discovery– the offshore Belier field – which helped me decide on petroleum geology, so I went to the university of Illinois to take an MSc in sedimentary geology. “I was very fortunate to have been awarded a scholarship, but this only took me to the Masters level, so then I had another decision to make – to continue my studies alone or return home. There was a position available to me with PETROCI, but I was very keen to get a PhD if I could. At the time I was considering teaching at university level as an option at some stage in my career – something I’d still like to do – so I decided to continue with my studies. I had various part-time jobs and also worked as a research and teaching assistant to cover costs and get more experience while doing my PhD. Photo Credit: ITLOS Photo In 1984 Dr. Diaby returned to his home country and a job in PETROCI, where he was involved in managing the hard data stored there and in setting up the sedimentology laboratory and core library. “I spent some time going through boxes of cuttings and thin sections and organizing petrography and petrophysics, before we got a scanning microscope, which made the job much easier. PETROCI was much smaller then, only about 150 people – it’s now about 470 people – and everyone knew everyone else. “In 1987 the Minister of Mines asked me to head up the Geological Survey, who were just starting a new major mapping project, with the assistance of the French Geological Survey, as well as German and Canadian support,” he continues. “Previously, Côte d’Ivoire had been mapped primarily at the 1/500,000 scale, but we managed to cover more than half of the country at the 1/200,000 scale. These programs also involved a geochemical strategic mapping project on various Precambrian greenstone belt areas. We had 10 mapping teams of young geologists who spent long periods in the field, and every month, except during the rainy season, I traveled all over the country visiting them. It was a very rewarding and enriching experience; many of the field geologists were locals with BSc degrees and this work helped them get advanced diplomas and degrees and move on to new jobs with mining companies, including SODEMI, the mining parastatal in the country. As Director of the Mines and Geological Survey Dr. Diaby was also involved in the drafting of the 1995 mining code and its fiscal regime and actively participated in an international promotional drive for iron and gold mining investments in the country. With the hard rock nature of the geology in Côte d’Ivoire, this was quite a challenge for a sedimentologist – he had to dig out his undergraduate course notes to remind himself of what it was all about. From a marginal gold producer status in the 1990s (about 2 metric tons/year) Côte d’Ivoire now produces over 20 mt/y. 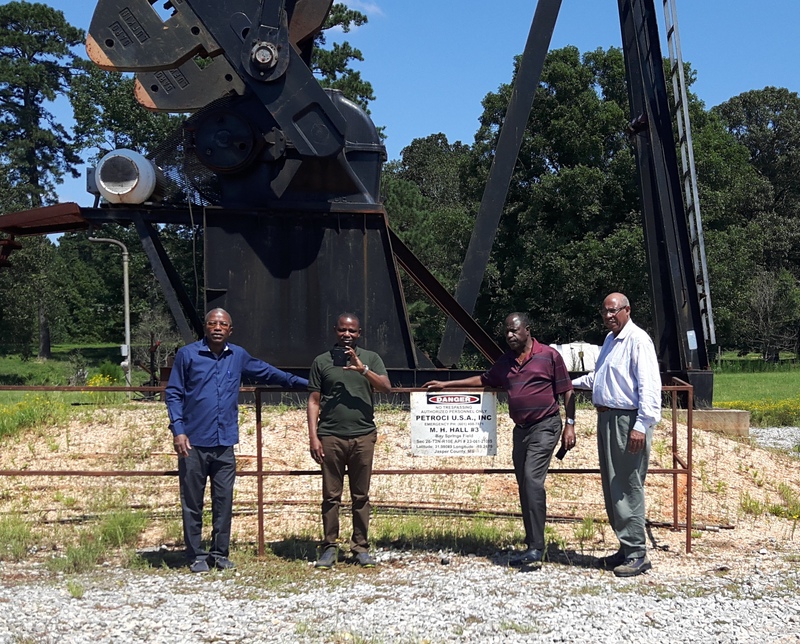 Dr. Diaby (left) at a small marginal field PETROCI is involved in in southern Mississippi, USA. In 1998 Dr. Diaby moved back to PETROCI, and from 2000 to 2003 was Director of Hydrocarbons and later Technical Advisor at the Ministry of Mines and Energy. Unfortunately, however, as the country spilled deeper into civil war, he had to leave the Ministry and work independently for a number of years. Photo Credit: ITLOS Photo In 2011 the UN and other international intervention helped end the war, the country became more peaceful, and Ibrahima was able to return home. “Abidjan was full of potholes, with grim marks like bullet holes on the walls,” he remembers, “but it wasn’t too badly destroyed, as it hadn’t been bombed out, like some war zone cities seen in international news. “On my return I was appointed as a Special Advisor to the Minister of Mines, Petroleum and Energy and in August 2011 became General Director for Hydrocarbons at the Ministry of Petroleum and Energy. In this post I led negotiations for 25 new Production Sharing Contracts (PSC), which were signed between December 2011 and April 2017. “I also coordinated and implemented a scholarship program for undergraduate Ivorian students studying abroad, the previous one having terminated in about 1980. Being the beneficiary of such a scholarship myself, I know how important it is to ensure our young people are well trained, with some having experience abroad,” he explains. “In the PSCs we obtained a budget for training in geosciences and energy so young Ivoirians could study in places like the US, UK, Canada and France as well as locally. Over 100 are studying abroad at the moment and there is also some shortterm foreign vocational training. The first batch of students are due to graduate next June. Some will continue to Masters level, and others will find work back home with PETROCI. Hopefully some of our oil company partners will start development projects soon, allowing them to employ young Ivoirian geoscientists and engineers. Having kept at bay the Ebola epidemic which so decimated its neighbors, primarily through stringent sanitary methods and public hygiene, Côte d’Ivoire is looking forward to a brighter future, and Dr. Diaby believes that oil, and particularly natural gas, will prove an important part of that. Recently appointed to his role as CEO of PETROCI Holding, he believes that diversification will prove important for the future. “We can’t just sit around waiting for oil to return to the $80 plus levels – we must survive with the current prices,” he says. “With this in mind, PETROCI has set up a pipeline operation and is a partner in a new LNG company. We believe that the offshore basin is gas-prone, and gas is key to our plans. At the moment our fields provide 220 to 240 MMcfgpd, all of which is used by local independent power producers, and we would like to find enough gas to supply the 10% predicted annual growth in electricity demand. About 70% of the population has access to electrical power – more in the cities – and we are diversifying sources with solar and hydroelectricity as well as natural gas. Some companies are close to a final investment decision on new fields which we expect will be agreed soon, hopefully with a suitable and stable gas price for long term investment. “We are a very modest oil producer at the moment – about 100,000 boepd,” he continues, “but we would like to double that by 2020. At the moment we export the light crude (about 42,000 bopd) we produce and we import and refine heavy crude oil. I hope that oil and gas will be a key contributor in helping my country grow and develop,” he adds. 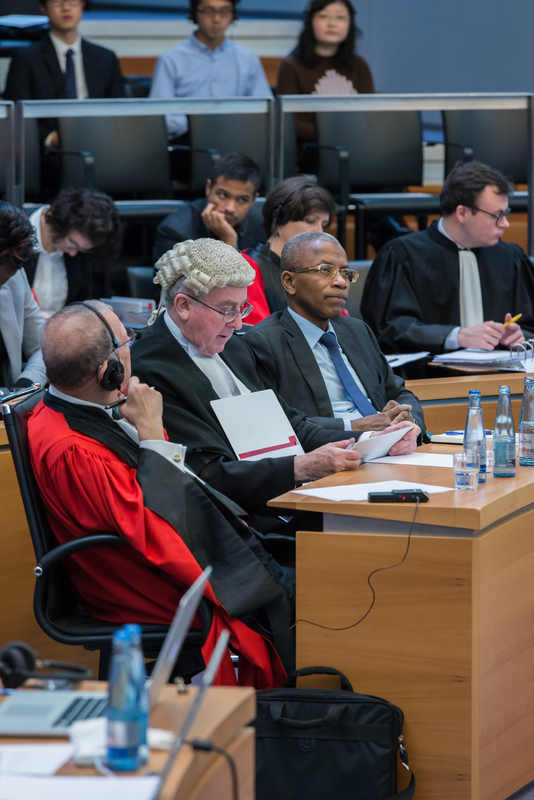 Dr. Diaby speaking at the International Tribunal for the Law of the Sea arbitration between Côte d’Ivoire and Ghana. For a number of years Côte d’Ivoire has been in discussions with Ghana over their respective maritime territorial limits, after the latter began to fast track developments in the border region, although no maritime territorial agreements have been signed between the two neighbors. Since November, 2011 Dr. Diaby has been involved in these discussions as a technical co-leader for the Côte d’Ivoire team. 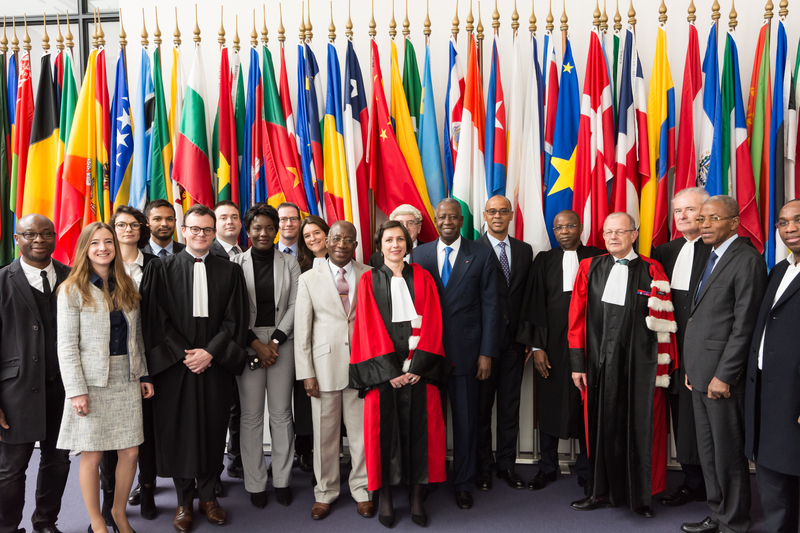 After the two countries failed to come to an agreement, in September 2014 the case passed to the International Tribunal for the Law of the Sea (ITLOS), a UN institution based in Germany. The final decision of the Special Chamber of ITLOS is expected to be delivered in September this year. The two countries have stressed, time and again, their good relations and readiness to cooperate in implementation of the ITLOS ruling. What advice would Dr. Ibrahima Diaby give to young African geoscientists considering a career in the oil and gas industry? “Well, the world has changed a lot since I started, so the first thing I would say is, be sure that this is really what you want to do. Also, look at the environmental and societal aspects of everything you undertake and make sure your training includes an understanding of how your work affects your local environment, as well as the bigger picture; I think this is very important. Internationally, China is becoming an ever bigger player in oil and gas and in world trade, so keep that in mind. And don’t forget that scientists can make a big difference and play an important role in so many areas of a nation’s life.